Morse was born on New Year’s Eve 2007. He was from Quirino with Devonia and Sara with Devonia. It was a difficult delivery as Sara had inertia. So hence an emergency trip to the vet. So whilst everyone was out celebrating the new year I was stuck at the vets!! Anyhow, to cut a long story short, Sara had two dog puppies. One puppy really struggled for 8 days and unfortunately, gave up his fight for life. This left one male puppy. 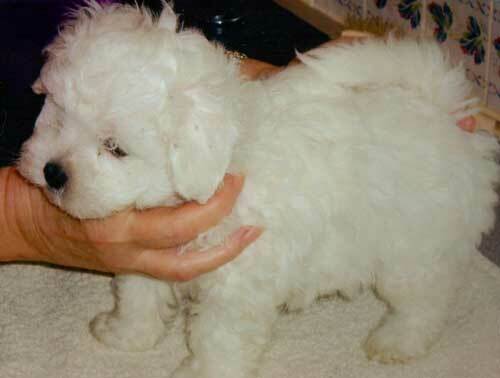 This puppy was later called Morse. He thrived and went on to be a lovely 8 week old puppy. 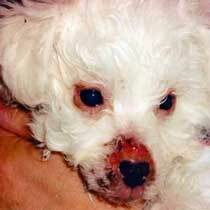 At the age of eight & a half weeks Morse contracted a rare disorder commonly known as "puppy strangles". I have written in depth on this subject at the foot of this page to give hope to anyone who encounters this very upsetting diagnosis in any of their puppies. Morse, so far has had a wonderful show career considering he had such a shaky start in life. He is full of energy and has a wonderful personality. Morse had various wins, various Best Puppy in Breed in 2008, 2009 brought a couple of Best of Breeds, 2010 wins are listed below. The rest of 2010 brought several other wins for Morse. I have not listed all these. 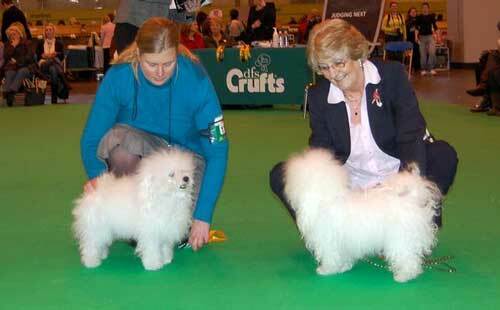 Again this year Morse has been out and about at several Championship Shows. He has had several Best Dog in Breed. 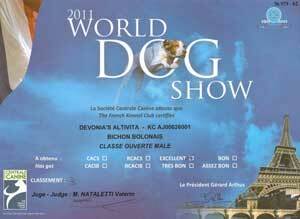 WORLD DOG SHOW held the day after. 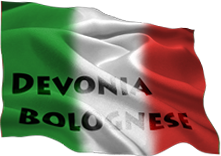 Bolognese from all over Europe. 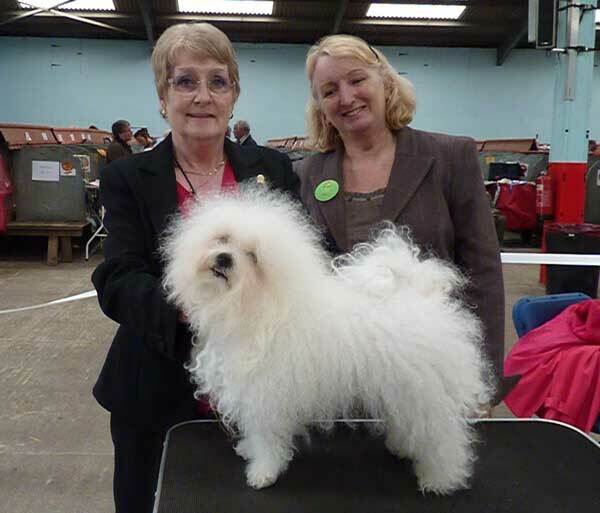 South Wales Kennel Association Championship show Oct 2011 Best Dog in Breed and Best of Breed under Breed Specialist Judge Cindy McCarthy. 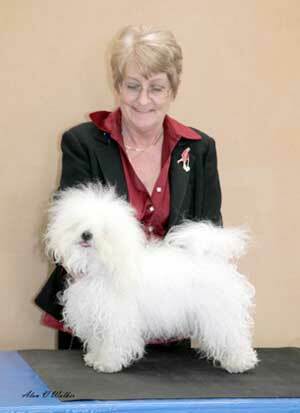 Ladies Kennel Association Championship show in December Morse had another Best Dog in Breed and Best of Breed under breed Specialist judge Carolyn Alcock. 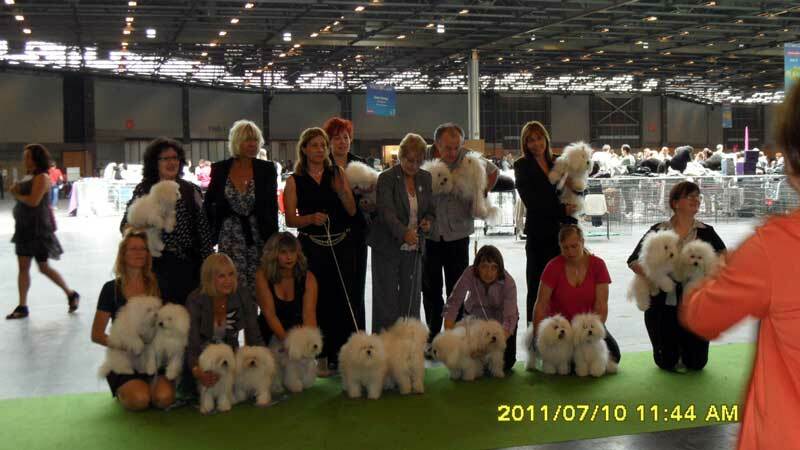 The Toy group was judged by Breed Specialist Liz Stannard and to our great joy Morse made the final cut in this group. A great end to 2011. Morse was only shown occasionally this year. 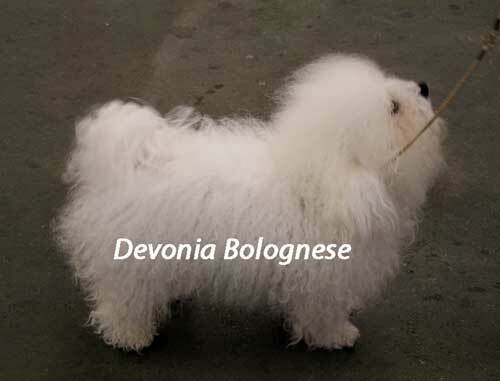 On the same day we had the British Bolognese Club show and Morse had Best Dog in Breed and Reserve Best in show. So although lightly shown this year, this little lad is still doing me proud. Morse was not shown at all during 2013 or 2014 as I had a couple of youngsters to campaign. Morse is now a veteran and is having a well earned rest and lives with my daughter. With Morse he went lame on his front leg. He went to the Vet at the age of 8 weeks and had an X-ray. This showed no problems, so we then sent the X-ray to an Orthopaedic specialist, who again could not find anything wrong. Within a few days he came up with lots of pustules on his eyes, ears, mouth and between his pads etc., He was back and forth to the Vet who sent off various samples for analysis. One evening he was so poorly and he had a large lump that had formed on his throat and was having problems breathing. A trip to an Emergency Vet and the lump just burst, it was quite alarming and there was blood everywhere. 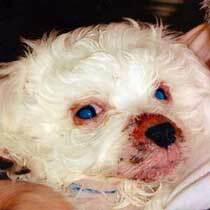 Morse was given yet more antibiotics and the wound had to be cleaned every few hours. It was very frightening as we had no idea what was wrong. Anyhow, within a few days the Vet diagnosed what was wrong with him and his treatment commenced. This treatment went on for 5 months. He could not have a vaccination and was not socialised as he could not go out. During this treatment, and I think due to the amount of pustules he had on his face, eyes and pads, he lost his pigmentation. So from a lovely black nose and pads it went to a dullish pinky brown colour. I have gathered some information below on this disorder in the hopes that it may help someone in the future. The condition can be referred to as juvenile cellulitis, cellular dermatitis, juvenile pyoderma, or more commonly puppy strangles. It has a number of symptoms, any and all of which may occur, and in varying order. Among them are the appearance of small, pimple-like bumps around the eyes, the muzzle, the abdomen, and other parts of the body. These mock the appearance of bacterial rashes, and may break open and weep a yellowish liquid and then crust over. The presence of pustules inside the ears are a real warning sign. They begin quite small and can eventually cover the inner surface of the ear with weeping pustules. The entire ear leather may also swell significantly. 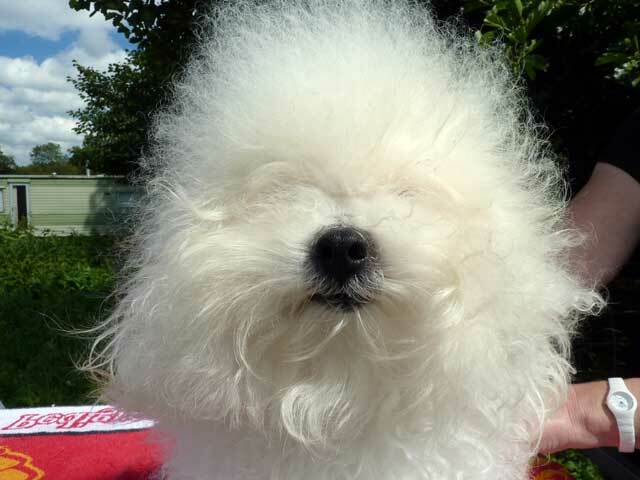 Other signs include discharge from, swelling of, and hair loss around the eyes, swelling of the muzzle with attendant hair loss, and swollen lymph nodes in the throat and in the backs of the thighs. Be particularly concerned if rash-like areas are accompanied by swollen glands. This is primarily an immune system disorder, and although it may look like a bacterial infection, it will not respond to antibiotic treatment alone. Other similar appearing skin outbreaks, such as puppy impetigo, result from minor bacterial infections, and will ultimately disappear whether treated or not. This is not the case with cellulitis. Essentially what is going on with the pups is that their immune systems are activated by normal development and environmental exposures but then overreact and start identifying the body's own tissues as agents to attack. The lymph glands swell since it is the lymphatic system that supplies and distributes the body's immune responses, and the pustules are actually filled with non-infected, sterile lymphatic fluid. You might think of the pup as having temporarily become allergic to himself. The condition is rare and can happen in any breed of dog, although some breeds such as Golden Retrievers etc., are more prone to it. It cannot be transmitted by contact from one littermate to another, or to anything or anyone else; and it can occur in one, a few, or all of the pups in a litter. The cause is not completely understood, but it does not seem to be a genetic problem. It generally onsets in pups between the ages of two and four months, takes two to eight weeks to run its course, and if properly treated, leaves the pup with a completely healthy and functional immune system and no effect on future health or lifespan. Because the immune system is running amok, so to speak, treatment consists of suppressing its action with corticosteroids, usually prednisone, with associated backup antibiotics in case of exposure to bacterial infection while the immune system is suppressed. Depending on the severity of the condition and the pup's response to treatment, the course of medication will run two to eight weeks. It is important to monitor the pup carefully once treatment has stopped. If the condition recurs, medication must be reinstituted for a longer period. Eventually the immune system will sort itself out. If the condition goes unidentified and untreated for some time, there may be rather extensive facial hair loss, which may result in some permanent adult scarring, but this is not the usual case. The other grave danger to the pup comes from the swelling of the lymph glands in the throat, which may actually enlarge to the point where they interfere with the pup's swallowing and breathing, thus the name puppy strangles. While on steroid therapy you may notice an increased appetite, rather alarming weight gain, and a tendency to pant and to appear overheated and uncomfortable. These are all unfortunate but unavoidable side effects which must be endured if they occur; they will resolve once the steroids are no longer needed. There is one possible complication from taking steroids at such an early age that may have serious adult consequences: It is thought that perhaps the steroids in some manner interfere with normal skeletal growth and development. Of particular concern are the hip joints. To counteract any such potential damage, it is now recommended that the pup take an oral glucosamine complex supplement throughout the course of steroid therapy. Another important situation to be aware of is that while the pup's immune system is being suppressed by the steroids, he will be unable to defend himself against any viral or parasitic disease that he encounters. 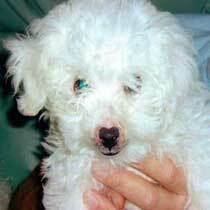 The antibiotics will usually take care of any bacterial problems, but the pup is especially vulnerable to parvovirus and demodectic mange at this time, and you must exercise extreme care not to expose him to possible contaminated environments nor let him get overtired or overstressed with activities or concentrated training. Unless your pup is actually taking steroids, you do not need to become alarmed or reduce his exposure in any way. If he does develop the condition, however, it will also mean that there is no point in giving any vaccinations while he is on steroids, and probably any vaccinations given prior to his developing the condition have been ineffective. Once he is over the cellulitis and has completed the course of steroids, consult with your vet or breeders for an appropriate vaccination schedule. When the steroids have been discontinued, observe your pup's condition and behaviour carefully. There may have been exposure to a bacteria that is not sensitive or is resistant to the particular supportive antibiotics that he has been taking. Symptoms of infection may have been masked by the steroids, and will become apparent once they are discontinued. If you should run into difficulties with your pup, and your Vet cannot seem to diagnose the problem, please seek a second opinion. I hope the above information will encourage anyone who encounters this dreadful disease and give hope that a puppy can recover and go on to lead a normal and healthy life. 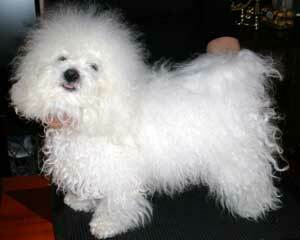 Despite the problems he had, he is patella free and eye clear and has sired a couple of very successful show dogs.